It’s Labor Day. Prepare for rain soon. In 2016, Labor Day is on September 5. This gives you a few more days to make plans for your one-day vacay from work. Whatever you decide to do (or not do) on this day off, one thing you’ll need to get around to is prepping for the end of summer. In fact, Labor Day, while not officially the end of summer, marks the end of summer in most people’s minds since it falls so closely with the Fall Equinox a couple of weeks away. The end of summer means the approaching end of this sweltering heat, but for many in the country, it also means having to deal with a lot of rain. We might need the rain, but having to get out in it is never fun. Especially when you use a scooter or wheelchair. Here are some strategies for staying dry these next few months. You almost can’t have enough of these, because it always seems like the one you have is somewhere else when you need it. When you’re investing in some new umbrellas for yourself or your family, try the Brella Bag Umbrella Holder. With this nifty two-in-one carrying bag and umbrella holder, you can stay dry hands-free. 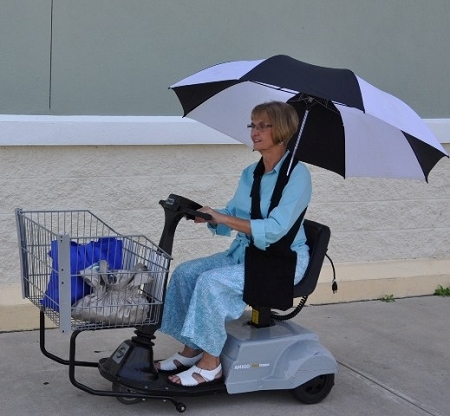 This makes it the ideal way to carry an umbrella while driving a scooter or doing other activities. Getting our legs and feet wet is almost a sure-fire way for many of us to come down with a nasty cold. And sometimes, especially while sitting in a scooter, an umbrella just doesn’t protect the legs enough. For this purpose, consider the Wheelchair Weather Chaps. These leg chaps feature an outer covering that is waterproof with a inside fleece lining to keep your legs toasty. It works great along with a jacket or umbrella to protect the upper body from the elements. And unlike ponchos, the Wheelchair Weather Chaps won’t get stuck in your wheels. Sometimes, ponchos may be the best option for scooter users looking for a full-body solution. Regular ponchos can get stuck in your wheels to create a dangerous situation. (Believe us, we know from experience!) Instead, use the Wheelchair Winter Poncho. The usefulness of the Wheelchair Winter Poncho lies in its tailored length to fit people who are sitting down. It is still important to take the proper precautions to ensure the poncho is not in the way of any wheels. 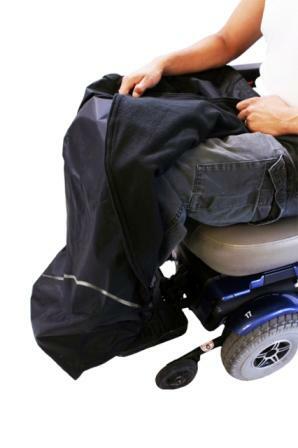 The Wheelchair Winter Poncho can keep you almost perfectly dry. Don’t give into the oncoming weather. Take a rain check on getting wet with these tips and products, and rest easy this Labor Day.